Living far away from Kerala in an alien city, I would not have heard of Dr. MM Basheer. I should thank a motley outfit of some fifty or sixty lunatics whom I would call Monkey troop for inadvertently introducing his name and a few of his works to me. No, Monkey Troop is not the name they gave themselves; though it is somewhat similar. I am resisting the urge to give them undeserved publicity by naming them – if I do, I would also bring shame to the memory of an ancient personage who is known and revered for his selfless devotion. of a literary genius whose life was cut short by providence), Vaikom Muhammad Basheer, G. Sankara Kurup, Vyloppilli Sreedhara Menon, Malayattoor Ramakrishnan, and many other eminent writers and thinkers felt proud to find themselves in print in Mathrubhoomi. With a history dating back to 1922, Mathrubhoomi had been fiercely patriotic, literally selective and greatly appreciated by the enlightened public and intellectuals of Kerala. As a young aspiring poet in late fifties (a contemporary was Yusuf Ali Kecheri, who later became a film lyrics writer), I was so much elated to find a small poem of mine published in Mathrubhoomi after several attempts. I still keep a tattered copy of that issue with my poem for which Mathrubhoomi paid me forty wholesome Rupees. Dr. MM Basheer is an advocate of ancient Indian culture, its literature and beliefs. He fiercely defends the slogan “Vande Mataram (Salute to Mother) which many Mullahs discourage their folk from chanting for fear that it’s a Hindu attempt to replace their own religious slogan, Allahu Akbar. I have only seen the videos of lectures of Dr. Basheer and public comments on his serial column in the Mathrubhoomi titled, in Malayalam, to mean Ramayanam – Nectar of Life’s Essence. The focus of his review is Valmiki’s incredible grasp of human mind. The videos I watched show Basheer’s vast knowledge and pride in Indian civilization, its history and epics. I felt he went overboard at places. He said India is the only Country with an epic – Mahabharatam – named after it. Actually, Mahabharatam means the story of a hugely destructive sibling clash in the Kuru kingdom in a region then known as Bharatam (named after King Bharata). Shakuntalam means the story of Shakuntala and Ramayanam means Story of Rama. Epic Mahaabharatam does not relate much to the divided India that we inherited from the British. Donald Trump might just as well take pride in a book called “History of America”. I find many things wrong with my Country and its culture of which Basheer sings Paeans. He is a recognized scholar; often invited to lecture in temples, mosques and churches. I see this trend as a faint sign of a move in the literate Kerala to appreciate the unity of different conceptual faiths rather than the violent dogmas implicit in them. I notice an appreciative audience to his lectures, which includes Pandits, Christian priests and Maulvis. His knowledge of the Vedas, Brahmanas, Puranas and epics is phenomenal; he uses it to promote unity among religions, so much, unlike Zakir Naik who quotes Upanishads with just the opposite intent. Barring a patch that is known as Mapila Riots which was a distant but bloody offshoot of the Middle East attempts at reviving the Caliphate, Islam and Hinduism have run friendly, parallel courses in the history of Kerala. Both Hindus Muslims and Christians sing praises of the adventures of India’s great admiral Kunjali Marakkar IV and the escapades of the lovable Muslim rogue, Kayamkulam Kochunni. I learnt about the flight of Prophet Muhammad from Mecca to Madina and his victorious return in my primary school textbooks. There were no riots to demand the burning of textbooks then. Kerala’s (perhaps entire South India’s) most popular deity, Swamy Ayyappa, had laid it down that those who visited to worship him in his hilltop temple during the wintry months must first worship Vavar, an Arabic Muslim friend of his. As you trek up the harsh trail to Ayyappa’s temple, you are required to shoot arrows at a tree that represents a demon – just as Haj Muslims are required to fling stones at the Satan on their way to the Kaaba while on pilgrimage to Mecca. Perhaps the two rituals have a connection. Basheer is not the only Muslim who lectures on India’s hoary culture and its beliefs or performs at Hindu temples. 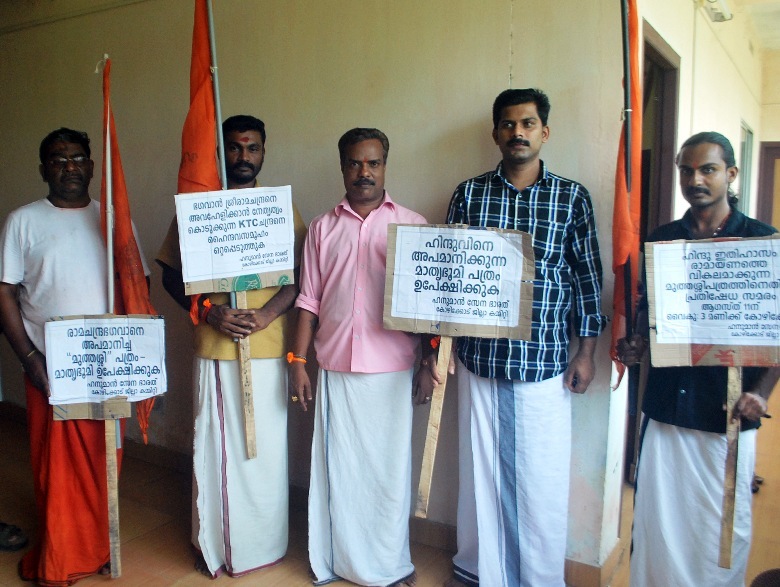 If a temple rule prohibits the entry of a Muslim, Basheer’s unity meetings are held outside. There are also Kathakali performers, Udukku-singers at the Sanctum Sanctorum of Hindu deities and Bharat Natyam dancers. Traditionally, Muslim group performers sing and dance at special folk performances during Onam festivities. In fact, Onam, celebrates the imaginary re-visit to Kerala by the legendary king, Mahabali, in whose reign all men and women were treated equally. A traditional ode to Mahabali sung by children describes his reign as one where there was no theft, no lies, and no murder because – you are right – all citizens had equal rights. In the story behind the festival, Vishnu is the villain. Among the diaspora, Christians and Muslims often take the initiative in celebrating Onam festival and a group dinner with traditional Kerala Cuisine. In wider India, Muslims mould and decorate beautiful Durga images for Durga Pooja; they create huge effigies of Ravana and Kumbhkarna to be set alight at the end of the nine-day long Ramleela plays. The brass moulding artisans of Kerala having gone to the Islamic Gulf Countries, it is the Muslims of Aligarh who make the sacred oil lamps (Nila vilak) , Kamandalus (Kindi in Malayalam, meaning a small vessel with a spout) and other things needed for worship in Hindu temples. A lullaby to the deity Ayyappa, first sung by Christian Yesudas (Harivarasanam) is what the Keralite Hindu devotees across the world sing in choir at the end of a day’s worship to Lord Ayyappa, whose temples have sprung up everywhere. Dr.Basheer, as I said, is not alone, but he stands tall with his scholarly discourses, passion and oratory skill while many Hindu Babas mouth inanities at their Satsanghs (sacred meetings) from their rich Ashrams. 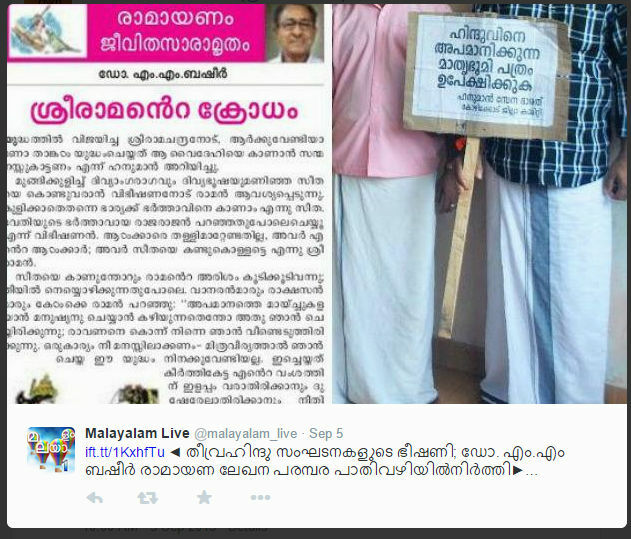 One who appears on Asianet channel in the mornings often misinterpret Sanskrit phrases or glosses over them. The finest example of a joint venture between Muslim and Hindu talents is the large-canvas, exquisitely done Mahabharat TV serial of 1998. The mammoth production was scripted by an Urdu writer – Rahi Masoom Raza. 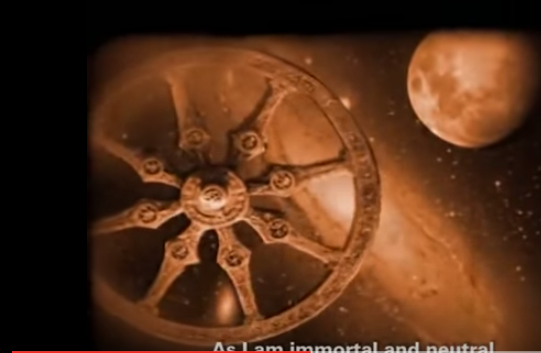 Raza’s concept of the rotating Time Wheel as the story presenter (Sutradhar; literally puppeteer) has been a trailblazer for many legend-based series that followed. His Sanskritised Hindustani became the language for movies and TV serials based on ancient stories and legends. Pranam (Humble Greetings), Ayushman Bhava (May you live long) are among the many phrases that have found regeneration in the Hindu palate from Raza’s script. Why should a Muslim write about our Ramayana, asks the Monkey Troop I mentioned. The gambling-addicted Yudhishtir or cunning Krishna were not treated with kid gloves or glossed over in Raza’s Mahabharat. Many of the leading characters – like Arjun, (Feroze Khan), Kunti (Nazneen) were Muslims. Yet I haven’t heard someone asking why a Muslim writer in Urdu should have written the grand serial or why a Muslim actor should have been picked to act as the foremost hero of the epic. Why didn’t anybody ask APJ Abdul Kalam how he had the temerity to write a whole book – his last – about Akshardham temples and its spiritual head, Pramukh Swamiji? Kalam sought and got the permission and cooperation of his older brother who was in his nineties, a pious Islamic scholar himself, to publish that book. The ancient dust-laden palm-leaf copies of the four Vedas were presented to the world in English by a Christian TH Griffith. He paid Sanskrit pandits to help him in the task of translating the ancient volumes faithfully. Hindu extremists demand that Muslims and Christians must appreciate and follow the ancient culture of India. Excuse me, that’s what Dr. Basheer was doing when the Monkey Troop got in the way and made the publishers of Mathrubhoomi go weak in the knees to discontinue the column. It’s a shame, but one must appreciate that these are times when hospitals are burnt down by fanatics when a terminal patient from their clan dies. 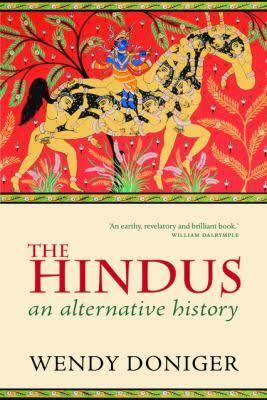 Penguin Books which pulped Wendy Donigar’s Hindus – An Alternative History – was faced with the same challenge and gave in. All publishers cannot dare go the Charlie Hebdo way. One gets the impression that Asaduddin/Akbaruddin Owaisis are a rarity in India; Unfortunately, Ashok Singhals, Praveen Togadias, “Sadhvi” Prachis and Pramod Muthaliks abound. Did those who led the shattering of a till-then inconsequential mosque pause to think how hurt we in India would feel if Pakistan were to demolish the Harappa and Mohan Jodaro monuments just as ISIS destroyed the Palmyra? Even assuming that the mosque was a symbol of Mughal atrocities on India’s heritage, such symbols must have been allowed to stand as a memorial to a historic proof of Mughal injustice. What Basheer couldn’t do for want of space in his column, and had to discontinue for fear of calumny, I would do. Not because I am any bolder, but because as a person I am less accessible and it is hard to ban my blogs. Basheer only wanted to show Valmiki’s psychological skills. I don’t find the need to be that apologetic. I reproduce below the part where Rama, in senseless and crude suspicion of his wife, spoke angrily and humiliated Sita in the presence of soldiers and their leaders when she came back to him, full of love and dreams. The words are Valmiki’s, and the translation is by Late Mr. Desiraju Hanumantha Rao, a Sanskrit scholar known for his piety and rendition skills. I have no claim to these passages which were borrowed with gratitude from http://valmikiramayan.net. Hearing those words spoken thus by Rama, Seetha with her eyes wide open like those of a female-deer, was bathed in tears. The heart of King Rama, as he saw Seetha, (the beloved of his heart) near him, was torn for fear of public scandal. In the midst of monkeys and demons, Rama spoke (as follows) to Seetha, whose eyes resembled the petals of a lotus, who wore dark curly hair and was endowed with fine hips. Hearing that unpalatable speech of her beloved husband, Seetha who used to hear pleasing words alone, was very much distressed for long, like a creeper attacked by the proboscis of an elephant, and she (thereupon) shed tears. ‹ PreviousANTI-TERRORISM TALKS WITH PAKISTAN ?-GIVE ME A BREAK ! It could very well be a fact. Till day, Rams (and Rahims, not to forget a few Roberts) and their mothers and sisters make their wives walk the fire, dip their hands in the fire, jump into the fire by alleging immorality and the right to honor killing. The Roberts, though merely fire at their Sitas (or Marys) – boom. I have a serious doubt that the first picture in this post is of a different Dr.M.M.Basheer. I have no reason to believe so. The photograph as is a video grab from one of Mr. Basheer’s discourses available on YouTube. The stat. report of the blog tells me that people close to the subjcect Mr. Basheer – if not Mr. Basheer himself – had viewed the blog. 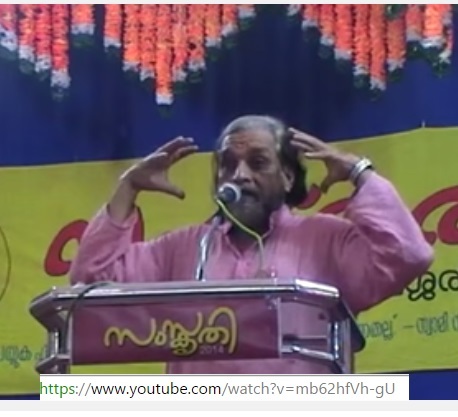 The SS of the Video shown is that of Dr.M M Basheer who is an allopathic doctor who preaches vehemently about the Hindu religion and its culture. The other Dr.MM Basheer is a Malayalam literary critic who was with Calicut University and wrote in Mathrubhumi about Ramayana which was opposed by some fringe elements in the Hindu religion. Hope you got clarification on both persons. If the picture is a wrong one, I regret it. Perhaps the Malayalam critic who wrote in Mathrubhoomi should be the right one that suits the context. However, Mr. Basheer who speaks ‘vehemently’ in favour of a religion that’s not his own but a culture that he believes to be his also deserves a place in my blogs. Thanks for the pointer. I will look for a picture of the right MM Basheer. If you could help me, send me the source/URL to vishumenon@rediffmail.com. Thanks.I am irrelgious, but very proud and fond of religious women and men with a broad mind and big heart.